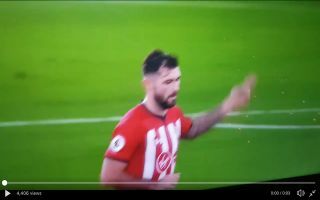 Southampton striker Charlie Austin was labelled a ‘legend’ by several football fans after footage emerged of him making a certain gesture towards Manchester City fans. The 29-year-old was heavily booed by City fans when he was leaving the pitch to be substituted and the former QPR talisman seemed to have had enough of the abuse from City fans and directed a two-fingered gesture towards them. According to Sky Sports, the FA are “seeking observations” on the incident, Austin could find himself facing a ban or a fine from the FA if he is charged with any kind of misconduct. Charlie Austin is a legend! ???? Charlie Austin isn’t swearing at anybody.